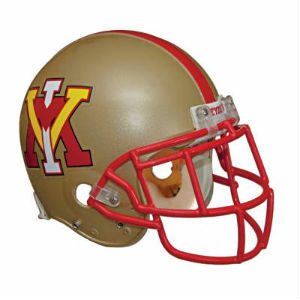 The VMI football team conducted a 78-play scrimmage Saturday afternoon at Foster Stadium giving head coach Scott Wachenheim and staff plenty to evaluate with two-deep and remaining starting jobs up for grabs. The scrimmage, originally scheduled for Friday but moved to Saturday because of threatening weather forecasts, was the first and only full scale scrimmage on the preseason camp docket. The 78 plays were divided by 13 possessions with the defense producing two touchdowns off turnovers and the offense rallying with three touchdowns including back-to-back TD strikes the last two drives of the afternoon. Redshirt sophomore quarterback Austin Coulling and redshirt freshman Duncan Hodges took most of the offensive snaps at quarterback with Coulling completing 9 of 16 passes for 126 yards and a touchdown while rushing for another score, and Hodges completing 8 of 12 passes for 51 yards with an interception. The opening drive saw the offense move 53 yards on 12 plays to the 11-yard line but came up empty on a 22-yard field goal try. The defense then clamped down the next three possessions limiting the offensive units to just 16 plays and holding one drive on downs at midfield. The offense began to show spark in the fifth possession and moved to the three-yard line before setting on a 26-yard field goal by Tommy Smith. The defense produced a big play in the ensuing possession after the offense had moved to the +29 yard line. A fumble batted into the backfield was scooped up by senior outside linebacker Tony Richardson who would have raced 45 yards for a score in game conditions. The offense rebounded the next drive with its most steady and consistent possession moving 55 yards on eight plays before Coulling dashed in from six yards out for the first offensive touchdown of the day. A 30-yard completion to freshman Devone Humphrey and consecutive slants to redshirt freshman Kendrick Jackson moved the ball to the red zone. After a three-and-out, the defense produced back-to-back turnovers over the next two possessions with a fumble recovery at the 28-yard line and a 48-yard interception return by redshirt freshman Elliott Brewster. The offense closed out the last three possessions with touchdowns coming on a one-yard run by Daz Palmer in a goaline series, a 48-yard TD pass from Coulling to freshman Christopher Owens, and 36-yard TD strike from freshman QB Reece Udinski to redshirt freshman Matt Blaser. The offense generated 18 first downs on the afternoon. Three penalties were assessed with one of the defense (interference) and two on the offense (presnap). Defensively, junior cornerback Riuq Trotman broke up two passes and sophomore outside linebacker Kunoy Deng, freshman defensive back Collin Loftis, and redshirt sophomore Tyler Fedison also registered pass breakups. Redshirt junior outside linebacker Brian Lipscomb, freshman linebacker Tyren Cloyd, and sophomore defensive end Ryan Clark had tackles-for-loss. Freshman running back Chima Kpaduwa led all rushers with 30 yards on six carries.